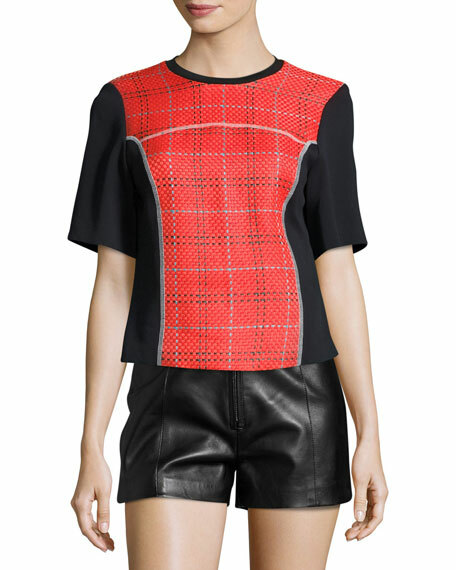 3.1 Phillip Lim top in surf plaid with solid contrast. Crew neckline; silk lace-up back. Phillip Lim debuted his eponymous brand 3.1 Phillip Lim in the fall of 2005. Bucking the ostentatious runway trends of the time, his line of youthfully elegant wardrobe classics with a twist was an instant sensation. Today Phillip Lim finds himself pioneering a contemporary brand designing women's, men's, accessories, shoes, making him one of the most talented and successful young designers today. For in-store inquiries, use sku #1960949.